It’s a common question, often posed when people are trying to get to know one another. I was asked it by a friend just a few weeks ago. I glanced around. What would I take? A treasured book? A memento? Or something more practical, like my computer? It was hard to say. I remembered this exchange when I saw sculptor Orna Ben-Ami’s new exhibit, “Entire Life in a Package.” In these pieces, through a unique technique of combining photographs with welded iron sculpture, the objects that people take with them when they flee come into focus. 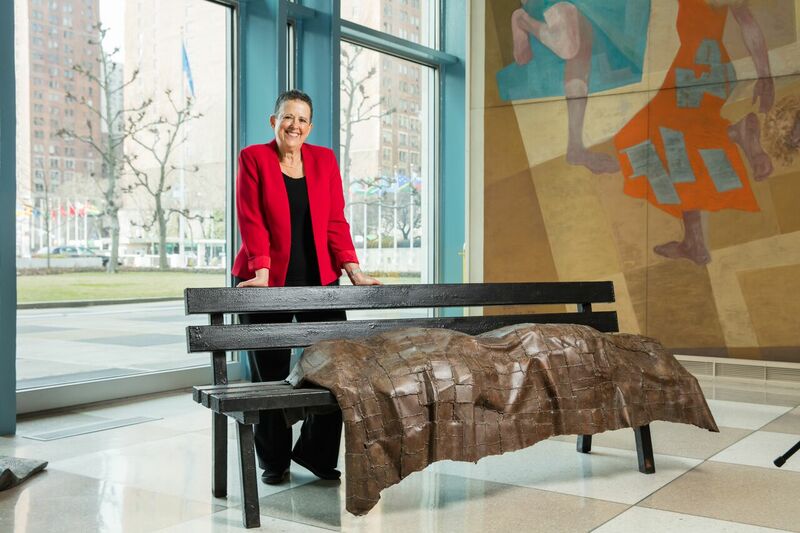 Held at the United Nations’ New York headquarters starting on February 27, “Entire Life in a Package” uses sculpture to reveal the humanity and sorrow of the refugee experience. Ben-Ami’s images, taken from Reuters archives, show a human population in transit, illuminating the objects that accompany these journeys in the form of welded iron emerging from the photographs. The images come from innumerable countries over the past 20 years, but the works highlight their universality. Ben-Ami chose to focus on recent images so that the pieces would speak to the world today, especially the refugee crisis currently sweeping the Middle East and Europe. But she also sought to walk the line between specificity and universality. “The idea is not to show where these people are coming from. It’s the same situation. It doesn’t matter what part of history. It’s the sameness that interests me,” she says. Many of the photographs have been manipulated to emphasize this “sameness.” Rendered in black and white, the recent images acquire the weight of history, while the iron emerging from older photographs creates a sense of physicality and immediacy. Throughout her long career in sculpture, Ben-Ami has worked almost exclusively with iron and other heavy metals. “I’m a welder,” she says happily. She stands out as a woman working in a medium that tends to be dominated by men, and she sees herself as having a special role as a result. “Men let the iron be iron. I’m trying to take it elsewhere,” she says. In Ben-Ami’s work we see just how far iron can be taken. Under her guidance, it transforms into something which is simultaneously softened and warmed while retaining its heaviness and power. At times, it has the softness of fabric. It ripples like silk and puckers like leather. But through all its transformations it holds its strength. “Iron is the material of monuments,” she says. “It stays there to remind.” In this way, “Entire Life in a Package” highlights the relationship of refugees to their objects as a relationship of individuals to the monuments of their own lives. When all else is left behind or forgotten, our objects remain and continue to tell our story, in many cases after we can no longer tell them ourselves. It’s not only objects that Ben-Ami renders in iron. In some of the pieces from “Entire Life in a Package,” it is the individuals themselves. One such image shows a boat crowded far past capacity. Packed in so tight, some of the passengers have a leg hanging over the side of the boat so they can fit in. 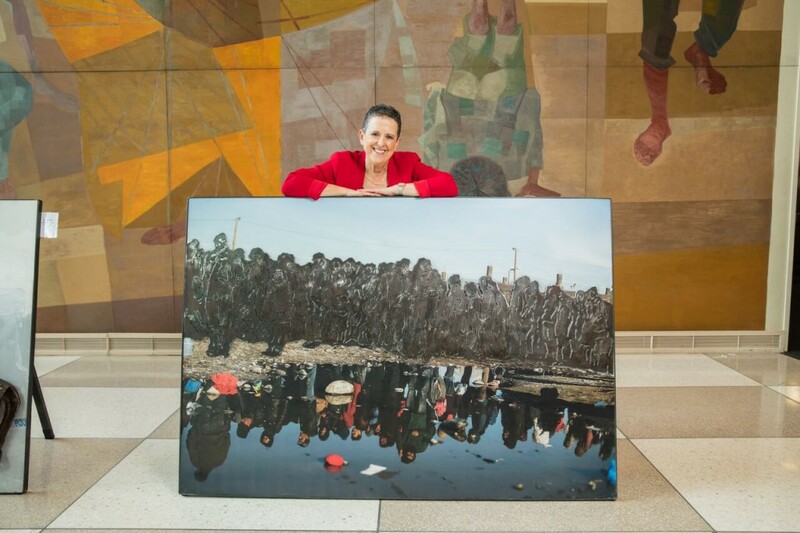 In Ben-Ami’s rendering of the photo, the refugees are made into a solid block of iron. Connected to one another and unified by circumstance, they blend into a solid mass. A similar image shows a line of people with parcels and packages under their arms walking across a weary, polluted landscape. It is rendered as a single plate of iron, highlighting the loss of individuality and the singularity of experience faced by people in flight. In this photograph, however, the individuals are walking past a large puddle that captures their reflections. In the reflection we see them not as iron but as flesh and blood, as individuals, each on their own journey. The range of techniques in Ben-Ami’s works call to mind the different viewpoints from which we see refugees today. As the crisis in Syria rages on with no end in sight, the story circles in and out of the headlines. In a news-saturated society, it is all too easy to become desensitized to the plight of refugees, to become lost in the sheer number of them. It becomes difficult to see individual faces and make a meaningful, emotional connection with them. Pieces like Ben-Ami’s bring awareness to this loss of perspective: We see refugees as a mass, impersonal phenomenon until a vivid reflection suddenly forces us to see individual lives, faces, and names. I ask Ben-Ami how she felt about the work appearing at the UN. “As an artist I want it to be shown to the world in the right place where the world can see it. I want it to be there. These are the people I want to see my work,” she says. The exhibition at the UN will run from February 27-March 10. Afterwards, a collection of Ben-Ami’s work (including some from “Entire Life in a Package”) will be on display at the Waterfall Mansion and Gallery in Manhattan from March 29-May 8. Matthew Schultz is a writer living and working in Tel Aviv. His work has appeared in Ecotone Journal, Tablet Magazine and the Jerusalem Post.